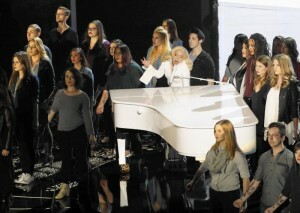 For those of us working to end sexual violence, the brightest stars to shine at the Oscars last night were the young survivors who stood on stage with Lady Gaga as she performed her song from The Hunting Ground, “Til It Happens to You”. With words and phrases like “survivor” and “it happened to me” written across their forearms, these brave individuals stood in front of millions letting all survivors of sexual violence know that they are not alone. The great thing about the 2016 Oscars, though, was that the focus on sexual violence was not just limited to Lady Gaga’s performance. The award for Best Picture went to Spotlight, a film about the Boston Globe reporters who uncovered widespread child sexual abuse within the Catholic Church and Brie Larson won Best Actress for her role in Room where she portrayed a survivor of kidnapping and sexual assault. There was also a focus on prevention. Vice President Joe Biden, who introduced Lady Gaga’s performance, spoke to all of us when he said, “Let’s change the culture” and encouraged people to take the It’s on Us pledge to prevent sexual violence. It was reported that soon after this call to action from Vice President Biden, the It’s On Us website was down likely due to so many people trying to access the site. It was a significant moment in Oscar history to see sexual violence, including campus sexual assault and child sexual abuse, recognized as seriously as it deserves to be treated. Watching the audience react with a standing ovation to Lady Gaga’s performance and hearing the Vice President urge viewers to get involved was also a significant moment for our movement. Changing culture takes time, but if last night was any indication, it is definitely happening.